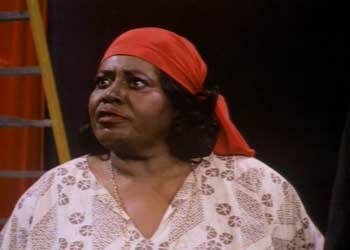 I had assumed that the classic mammy stereotype died sometime between the cancellation of Beulah in the 1950s and the re-design of Aunt Jemima’s waffle mix in the ’80s, but lo and behold, turns out she was alive and well as late as 1991. 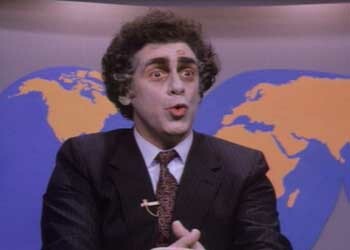 I should’ve known that Elliott Gould was involved somehow. Most of the blame, however, goes to writer/director Malcolm Marmorstein, who’d been writing TV scripts since the 1960s and apparently thought that Eisenhower was still in office when he wrote the script for Dead Men Don’t Die. 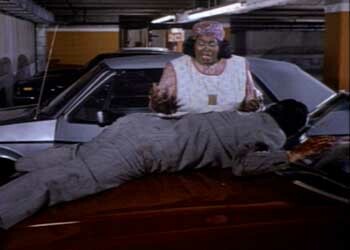 The mammy in question here, Chafuka, is played by Mabel King of What’s Happening!!! 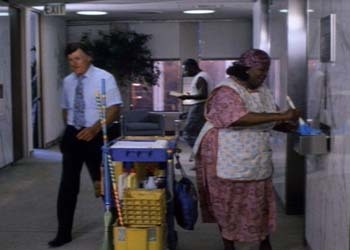 fame and manages the impressive feat of being a triple stereotype: she’s a doo rag-wearing mammy, a maid (or rather, a cleaning lady) AND an aspiring voodoo priestess. What, no prostitution? Chafuka is overjoyed when she finds that news anchorman Barry Barron (Gould) has been killed by drug dealers; now she can conjure her very own zombie! Gould, of course, makes a ridiculous member of the undead, mugging for the camera like a minstrel in whiteface, and even though it’s played for laughs, his performance, like the film, is brutally unfunny. Marmorstein’s sense of humor is much like his sense of racial dynamics: permanently trapped in the pre-Civil Rights era. Chafuka speaks in pidgin English, informing Barry that “You be my zombie. I be your high priestess.” Rather pompously, she relates that she’s now his manager and will henceforth share in his wealth, unswayed by the fact that he’s now: A) dead and B) unable to speak. She figures out a way to make him talk by using a voodoo doll that gets him to repeat whatever she says to it, so once he gets in front of the camera, of course begins to speak with her ridiculous, semi-literate accent. Hilarity ensues. The drug dealers see Barry on the newscast and return to kill him again. When one of them is inadvertently shot by Gould, Chafuka feels bad and decides to raise him from the dead, too. 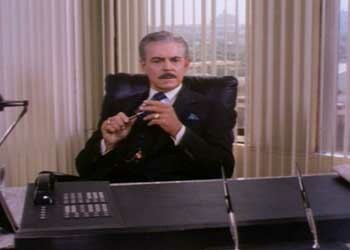 He in turn kills his colleague, and we have another zombie…and another…and another…and you get the picture. This sort of madcap comedy (musical montages anyone?) 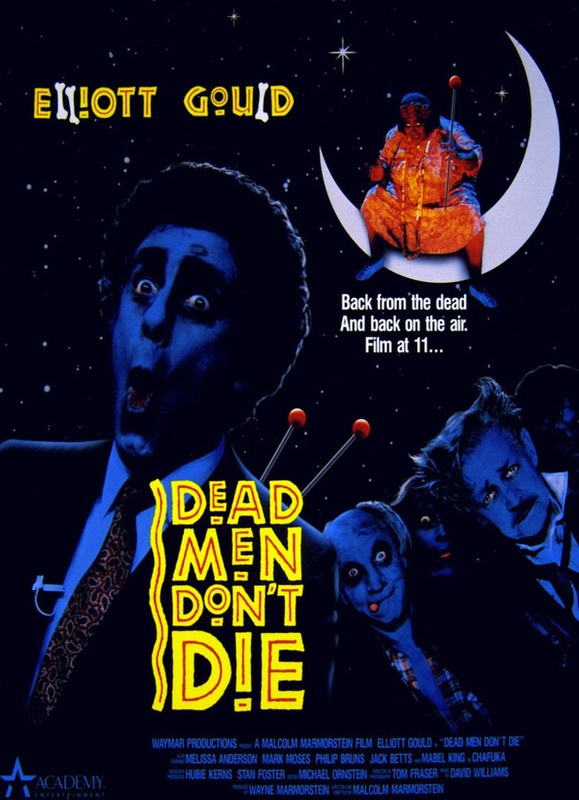 died in the ’80s, sometime around the Yahoo Serious invasion, but apparently no one here got the memo. Dead Men Don’t Die makes Weekend at Bernie’s II look like Weekend at Bernie’s I.
Esther used extra phlegm when polishing the “Whites only” water fountain. Acid wash jeans often provoke this reaction. Esther used extra phlegm when polishing the "Whites only" water fountain .